Draft the custody portion of the divorce or paternity petition. List the names and contact information of both parents and the child, and the child's age. Ask for either sole or joint custody and briefly tell the court why it should grant your request. Include a request for your choice of visitation schedule and child support. An online legal document preparer or attorney can help you. Sign the petition. Include a notarized statement about any other legal cases that have involved the child and list all the child's addresses. File the petition with the family law court in the county where you live and pay the filing fee. Deliver a copy of the petition to the sheriff's office in the county where the other parent lives, or deliver it to a professional process server, for delivery to the other parent. Usually there is a small fee. Once the other parent receives the petition, under South Carolina law he has 30 days to file an answer or counterclaim. Schedule a temporary hearing after the response time ends by calling the family law clerk of court, or the judicial assistant to the judge assigned to your case. The clerk's office or the judicial assistant issues a notice to both parents noting the date and time of the hearing. Appear at the temporary hearing. If the other parent objects to your request for custody, expect the court to order mediation. At mediation, a professional mediator meets with each parent and tries to negotiate a mutually agreed upon custody, visitation and support agreement. If an agreement is reached, both parents and the mediator sign it, and the mediator files it with the court. Another hearing date and time is scheduled, at which only one parent need appear to present the agreement to the judge for signature. Prepare for trial if no agreement is reached at mediation. Send the other parent the South Carolina standard family law interrogatories and requests for production of evidence provided in the South Carolina rules of family law procedure. He must send you the information they request within 30 days of receipt. Subpoena any witnesses and additional documents that help convince the court to grant your petition and deny any counterclaim, including income and medical records, and testimony or documentation of unfit parenting, physical or substance abuse or unsafe lifestyle that would be detrimental to a child. Present your case at trial by calling any witnesses and presenting any documents that support your request for custody. Answer any questions asked by the judge. Once your case is presented the other parent presents his case. Usually the judge does not make a decision at trial but issues an order deciding custody, visitation and support a short time thereafter. Draft a counterclaim if you are the parent receiving a petition for custody and you want a different arrangement than that requested in the petition. The counterclaim requires the names and contact information of both parents and the child and the child's age. Ask for either sole or joint custody and briefly tell the court why it should grant your custody request rather than that of the other parent. Include a request for your choice of visitation schedule and child support. Sign the counterclaim. File the counterclaim under the same case number as the petition within 30 days of receiving the petition. Arrange for service of the counterclaim. The other parent may contact the court for a hearing date and time. If not, schedule a hearing. Appear at the hearing. 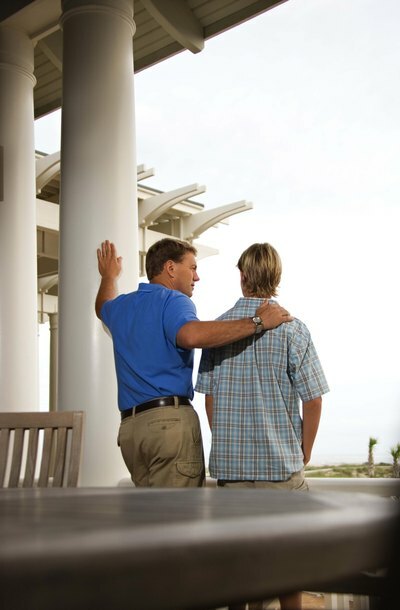 Unless both parents want the exact same custody, visitation and support schedule, expect to be ordered to mediation. Prepare for trial if no agreement is reached at mediation in the same manner that the original petitioner prepares. Prepare witnesses and evidence to counter the claims made in the original petition and present evidence of the arguments raised in your counterclaim. Wait for the petitioning parent to present her case at trial. Present your case in response by calling any witnesses and presenting any documents that support your request for custody. Answer any questions asked by the judge. An order reflecting the judge's decision is filed within a few days after the hearing, and the court mails copies to both parents.